Located in one of the most picturesque spots imaginable, the kind with rolling hills dotted with rounded Eucalyptus trees, with rich soil, good rainfall & a maritime-kissed breezes,Main Ridge on Victoria's Mornington Peninsula is one of those places which elicits a glazed-over expression when mentioned to the city folk of Melbourne. So here then, is the chance to dream, for a moment, of owning a home which not only resides in such a beautiful location, but which is, of itself, quite beautiful, with its fabulously patterned cathedral ceilings, all the better to frame the view out to the vineyards & gum trees. The house is clad - both on wall and roof - with Colorbond, as a contrast to the black-painted Cedar barn doors and black windows. Internally, walls are white and floors are limed French Oak, but it's those ceilings which have garnered my attention. But when a space has a multitude of heights, as in this kitchen for example, it also creates a sense of dynamic movement, with a combination of cosy and uplifting moods created by the different heights. Additionally, the human eye loves to follow a line, so as the rafters are expressed (rather than clad over), the eye naturally follows the rafter up to the ridge beam, which creates a sense of generosity with its height. Which is all rather clever, as the median height of the room is not actually that high. Imagine if there were a flat ceiling dropped in below the rafters instead. It wouldn't be half as interesting or cosy a space. Now there are times when a flat ceiling is a wonderful solution, but even in such a case, I will always suggest that a variation of height between spaces can be a very powerful (and clever) tool to create emotion and atmosphere. 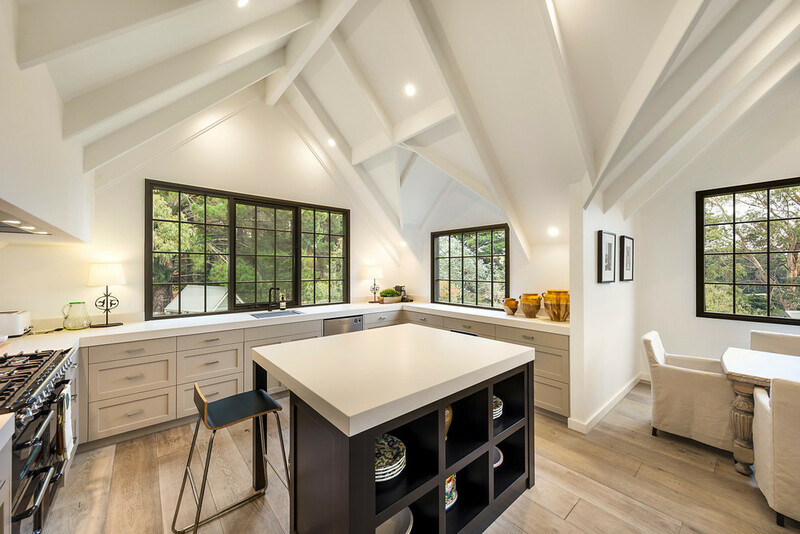 Of course, it's not just the ceiling height which can be used this way - it can also be the actual pattern which the ceiling has which can utilise this philosophy - as in this case with the expressed rafters creating an additional pattern on the angled ceiling shapes. Pattern on pattern, if you will. and high ceilings make for formality... In buildings (with) standard components, it is very hard to make the ceiling height vary from room to room, so it tends to be forgotten. In the same way that the generosity of the steps acts like an invitation to come hither, a generosity of ceiling heights can draw one into a space. It's nice to see a residential building which talks the same language internally and externally, as this one does. I think it would be a rather interesting home to live in.